Lesbian, gay, bisexual, transgender, queer, and questioning (LGBTQ) young people are 120% more likely to experience homelessness than non-LGBTQ youth. While many factors contribute to LGBTQ youth homelessness, identity-based family rejection is the most commonly cited reason. To end LGBTQ youth homelessness, we need to understand the issue and the ways in which we can all play a role in ending it. That's why we launched #TrueColorsDay, an international day to raise public awareness about LGBTQ youth homelessness, and to provide supporters with simple ways to make a difference. We also host live conversations online about the issue and what everyday people are doing to end it! Co-founded by Cyndi Lauper in 2008, True Colors United works to end youth homelessness by generating solutions that meet the unique needs of LGBTQ young people. Our philosophy is that if we can ensure that services are safe for and affirming of the most impacted young people, we can be confident that they’ll be safe and affirming for everyone. You might remember our old name: the True Colors Fund. 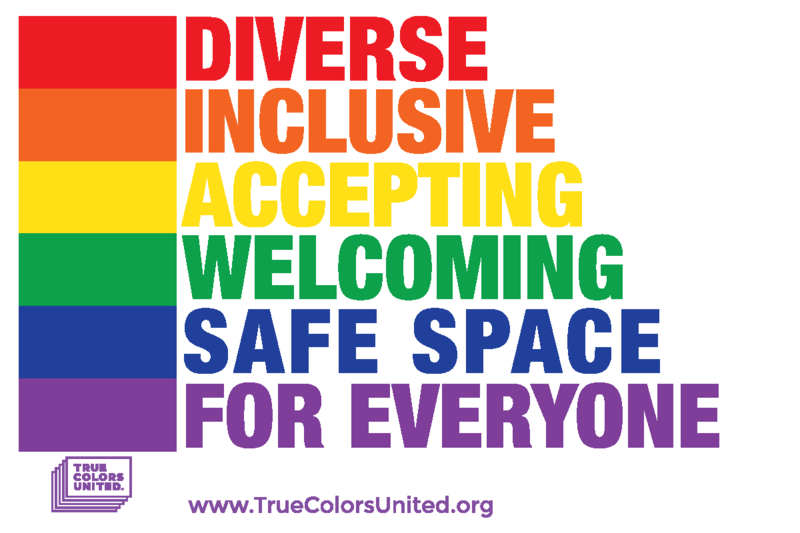 Our new name – True Colors United – is all about celebrating the different strengths that different people bring to the table, and applying those strengths toward one united goal: preventing and ending youth homelessness. Our voices are louder when we speak out together. Let your friends and family know about #TrueColorsDay and multiply your impact. Snap a photo with one of our “unselfie” signs and share it online with the hashtag #TrueColorsDay. Let's flood the Internet with these images to raise awareness and show the world that everyone can make a difference. Join True Colors United’s Coco Wheeler, MSW and Rivianna Hyatt as we kick off #TrueColorsDay and announce a brand new resource on LGBTQ youth homelessness. Right now, young people are leading, shaping, and revolutionizing the movement to end youth homelessness. Join Ziggy Keyes of the National Youth Forum on Homelessness and True Colors United’s Kahlib Barton and Rivianna Hyatt for a convo on how to make youth collaboration happen. Families aren’t always related by blood. Join members of the House of Garçon – Phoebe Van Cleefe, Jonathan Lykes, and Kahlib Barton – for a conversation about chosen families, the house and ballroom community, and how art and activism can overlap. Close your eyes and imagine the future. What do you see? Maddox Guerilla, 2018 True Colors Fellow, and Marc Dones, Executive Director of the National Innovation Service, will stop by to chat about their visions for creating equitable, collaborative, and democratic communities. Meet the nerds behind True Colors United! We’re serious about ending youth homelessness - but we don’t take ourselves too seriously. Tune in for a quick round of staff speed “friending” and get the inside scoop on who we are and why we do this work. That’s a wrap for the livestream – but #TrueColorsDay continues till midnight! If you haven’t yet, now’s the time to post those unselfies, spread the word, and learn more about LGBTQ youth homelessness. Together, we can and will end homelessness among LGBTQ youth.